Look! More sunflowers! 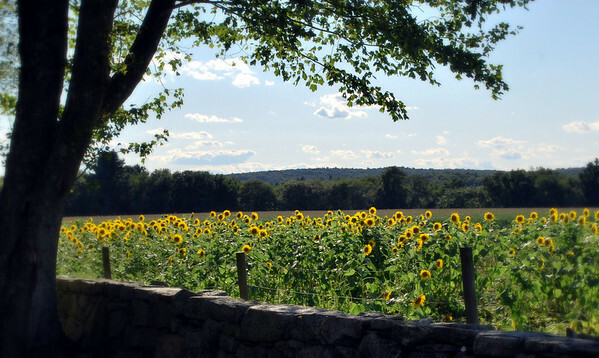 What with the two days of solid rain that we've had recently I thought it would be nice to post another picture from last Thursday when the sun was shining brightly on the few sunflowers that were remaining at Buttonwood Farm in Griswold. I always forget to go out there when the fields are full before their annual Sunflower for Wishes sale so I usually only end up with partial fields of flowers. Of course, when the fields are full the area is also full of people taking pictures and you guys know me, I'm not much on crowds regardless of where they are. Sometimes I really think I'm beginning to suffer from demophobia but then I remember that it's not that I have a fear of crowds, I just don't like them! Speaking of phobias, did you know that there's a rather comprehensive list of them available just by clicking here? I bet you could find a phobia for just about everything including 'Allodoxaphobia' - fear of opinions, 'Hippopotomonstrosesquipedaliophobia' - fear of long words, and 'Ponophobia' - fear of overworking or of pain. I'm pretty sure I don't have that last one being that I have spent the last few days putting in more overtime at work with more coming up later this week - which might mean that I suffer from 'Peniaphobia' - the fear of poverty! Either that or I'm just a glutton for punishment! The extra hours at work coupled with the rain made it a good day to come home and take a short nap which is exactly what I did; I tell ya, naps are wasted on the young! I knew I definitely needed one today as the Dispatch Center floor was starting to look really good to me right around noon-time so I wasted no time in curling up with my pillow when I got home at 3:00. Now I just hope I don't have any problems falling asleep later tonight being that I'll be back at work for 16 more hours tomorrow. I'm happy to report that I've been reading an honest-to-goodness book the past few days! I know that may not seem like much of an accomplishment to some but sadly, my love of reading has definitely taken a back seat to the rest of life lately and it's rare that I pick up something substantial to read anymore. There's a reason behind the book I'm reading right now though as I'll be going to Nashville with my cousin the last week in September and I figured it was about time I read "The Widow of the South" that Lois had sent to me last year when I was thinking of making a trip to Nashville with the same cousin. While cousin Amy is taking some seminars at the International Bluegrass Music Association Conference that she goes to annually, I'm hoping to hop on a Gray Line tour and visit the plantation where the book is set as well as visit the Town of Franklin where one of the most horrifying battles of the Civil War took place - also a major part of the book. I'm halfway through but still not quite sure if I like the book though as sometimes the author takes too many turns with a phrase and I just keep wishing he'd have written in regular old English. I do like the basic premise of the story and the history woven through it so I'll definitely finish it though I may not have as much of a glowing opinion as those who wrote on the back cover! Speaking of writing, I've still got plenty to write about my trip to Canada in July so keep an eye open for a post or two on The Distracted Wanderer before hopefully too much longer! With any luck I shall be able to dedicate some time on this next batch of days off to getting those posts written before my addled brain forgets where I went and what I saw. One last thing before I go rummage through the refrigerator - it has occurred to me that fall is fast-approaching and I wanted to try to make some sort of plan for foliage pictures this year - or as much of a plan as one can make when you're at the whim of Mother Nature and the changing colors of the leaves! I'm open to suggestions as to where to search for the reds, oranges, and yellows of autumn so if there's anywhere in particular you'd like to see a photo of, let me know and I'll see what I can do about getting a few pictures with you in mind. I know, I know - any excuse to travel around and take pictures, right?!? I love the shot of the sunflowers. Very nicely done. Well I'm sure you'll find a place to go for all those fall colors. In fact I'm positive. beautiful photo! and i love nashville, i think you will too. L♥ve Sunflowers. I need to grow some again next year. The bad part is what a pain they are to pull out when they're spent. But still. Dang it. I wish we were foliage seeking together. Since you mentioned the website about all those phobias, here's a site one of my favorite bloggers had on his blog about 2 weeks back -Oxymoron.com -check that baby out! It's even alphabetized and has oodles of oxymorons, some that are downright hysterical! And, while I'm writing this, thanks too for mentioning this book you're reading as it sounds like one I'd probably enjoy since I do really like to read stuff that is historically based. Enjoy the day -at least the sun is shining today -or it is here anyway. Is it sunny in your little piece of heaven on earth too today? I think I would have a fear of trying to actually spell some of those fears! I do like the sunflower photo...and know that wherever you go, you will show us the beautiful/interesting sights you see. The fear of long words just HAD to be a long word!